Since 2006, Thalassa has welcomed families and friends in abundance - they come to read, to sleep, to swing in hammocks to the sound of the sea, to write, to paint, to exercise, to chat, to swim and to eat local seafood and other delicacies. They love the sound of the sea and the deep peace of the place, the scent of tropical flowers and the comfort and kindness that six smiling attentive staff bring to our lives there. Thalassa is a beautiful family villa on the edge of a small palm plantation, through which guests walk in one minute to the sea down a white sand path through a gate of cinnamon sticks. Mahawella beach is a mile long and undeveloped and pristine - there are a couple of palm-fronded cabin restaurants and fishing boats. 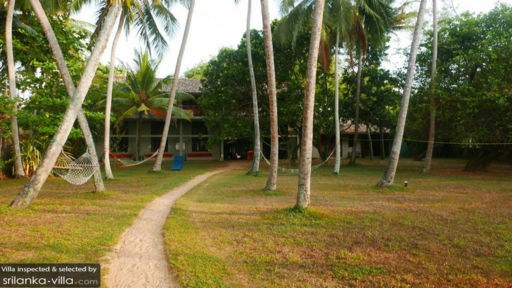 The house itself is well set back from the beach, so it is private and is also enormous and colourful - full of books and contemporary Sri Lankan art and antiques. 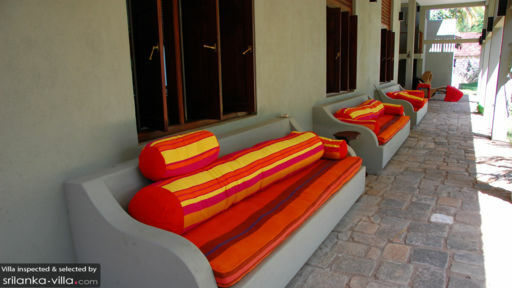 There are six charming bedrooms and each has an ensuite bathroom and a view of the sea. We chose thick mattresses and wonderful pillows, so our guests sleep soundly. Three distinct gardens enhance the house. The first is as you enter the driveway far from the road through the main gates and it is sheltered from the sea breezes, so a mass of flowers and trees grow there, principally 80-foot bamboo and bougainvillea, which create looping arches. The second garden is in the middle of the house around the 60-foot swimming pool, so the planting blends with the pool colours of blue and green and yellow - the flowering creepers dominate a wicker screen some 40 feet tall to ensure complete privacy. The third garden is the palm plantation with hammocks and plants which flourish in the sea-salty air. As you walk into Thalassa ( which means the sea in Greek) you can view the blue sparkling waves through a colonnade of ancient temple pillars. To your right is an open plan dining room which seats l6 and beyond it a hatchway to a big kitchen with Jaffna doors. There is also a study with a TV, books, DVDs and big cushions for family viewing. At the other end of the colonnade, there is an outside family sitting room with bright cushions and stairs up to four bedrooms. 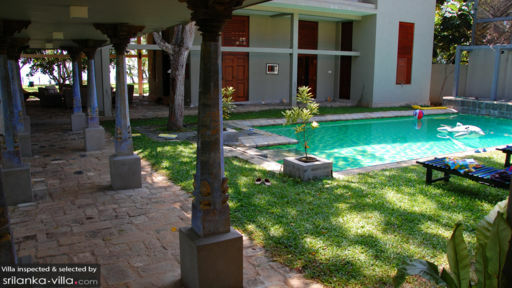 To your left are two bigger downstairs bedrooms and bathrooms with outside showers and to your right is a formal drawing room with a Burmese teak sprung floor, a high decorative ceiling, wooden screens above each doorway, a piano and daybed and an extra bathroom. We have two wonderful cooks, two maids to clean, iron, wash and mend and two male staff who serve food, do the gardening, drive a tuktuk to market and do odd jobs of all kinds. They are all parents and most of them grandparents too - they love children and are happy to entertain and babysit. Three live on the premises and three live locally with their families. They can advise on excursions and order up transport for you. They are a helpful, friendly, experienced team focussed on giving you whatever you wish while you stay there. Thalassa is situated in the extreme south of the island. It is about 3 hours from the airport at Colombo, mostly down fast motorways. It is well worth the trip to reach the most glorious scenery of dazzling small bays, waving palm trees and intense colours and scents of markets, flowers and spices and finally, the charm, order and peace of Thalassa itself.